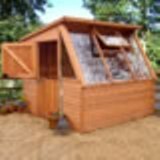 These excellent sturdy metal garden sheds are made from hot-dipped galvanised steel throughout and are substantially heavier and sturdier than all other "thin clad steel sheds" and therefore come with a superb 10 year "no rust perforation" warranty. This metal shed range features ventilated gables to help prevent condensation and extra wall height. The Foundation Kit is a hot dipped galvanised base frame that when assembled fits to your shed base. Lay this on top of a plastic sheet, making sure the ground surface is level. You can flood out the foundation kit with concrete creating your floor. The kit also comes with all fixtures and fittings. You do not require the foundation kit and timber flooring together. Freestanding shelving units are also available as an accessory, please see the following links for further details. * This manufacturer may charge extra for delivery to Scotland and offshore islands. Please enquire before ordering if you think this might apply to you. Your delivery maybe delayed if not checked at point of order. 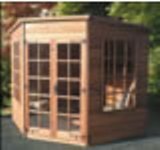 Traditional Security Shed Pent 2.14x1.52m a very secure garden shed. This full size Italian FAS commercial table has an optional coin-mechanism. Ideal for use in a garden office. Lawn Croquet Set with brightly coloured wooden mallets and balls. Ideal introductory set for children. The Oakington Circle from Grange, composted of two timber circles connected using stainless steel rods. Ideal as an archway over your garden path.